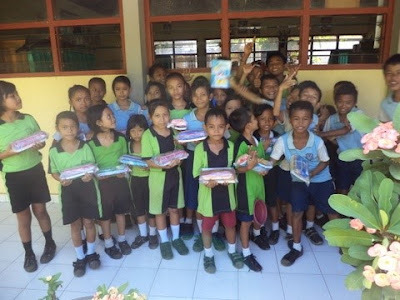 Now that we have settled into our new home base here in North Bali, I’d like to devote this news letter to informing you with specific information about how donated funds to A Heart For Children are being used for the support of school children. A large portion of our ministry focuses on helping children from remote villages to receive an Indonesian Government school education. Parents will go to great lengths to see that their eldest son gets a basic education, because that son will be their inheritor and their source of care when they are old. It’s a different story for the village girls, who often do not continue their education beyond 6th grade due to the economic burden school fees and uniform costs put on poor families. These girls often will work in the rice fields, attend to the pigs and marry a parent chosen older man while still in their mid teens… carrying on the tradition of their mothers and grandmothers. Tati and I are committed to triumphing over tradition to support these village girls. We have supplied girl students with undershirts (singlet’s), training bras (mini sets) and short leggings (mid thigh undies because they wear skirts). These items are usually unaffordable for the girls but they are necessary to avoid being belittled and teased by their male classmates and teachers. There are 20 village children that have received school uniforms, shoes and backpacks from A Heart For Children. We also pay the $20 monthly school fees for 8 of those students who are attending Jr. High and Sr. High Schools. In July we will be purchasing uniforms for 3 more girls entering Jr. High School and we will also be paying their monthly school fees. Students entering elementary, Jr. High and Sr. High Schools must wear the required 4 sets of uniforms costing $100. School shoes and socks are $17 and back packs cost $18. We are blessed and grateful that our supporters in the U.S.A. have provided the funding to pay for all of the school children’s expenses. Tati’s sister Mary is employed by the Indo Government as an English teacher. Some of the schools Mary is assigned to are located in remote mountain areas here in North Bali. We asked her to inform us when she comes into contact with children who may need assistance. Upon hearing about some of the children’s circumstances, and with the cooperation of the Head Master’s and teachers of 2 schools, Tati and Mary compiled a list of 40 children. Knowing that the students lacked basic school supplies and to have an introductory meeting with those selected students in their school setting, Tati, Mary and volunteers purchased and individually bagged 6 class notebooks, pencils, sharpeners, erasers, pens and a zippered carrying case of each of the 40 students. The kiddo’s are dressed in their sport uniforms for their once a week 1hr. of sport activities. Now Tati and Mary will make home visits to interview these needy children’s parents and or guardians to assess the kiddo’s living conditions, home life and the child’s desire to achieve in order to determine if further assistance would benefit the student. 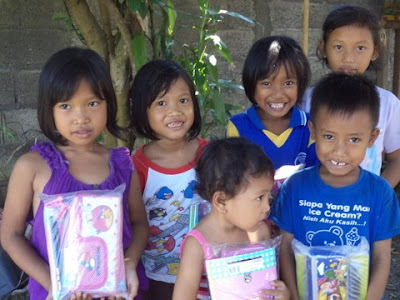 These village kiddo’s, who attend one of Tati’s weekly neighborhood classes, also received a packet of school supplies. Thank you all for your encouragement and for your support of the children we care for. Please keep us in your prayers, for we have many needs to meet in the coming months.